Starch is a carbohydrate. It is found in plants. Green plants make carbohydrates through photosynthesis. Starch is therefore in many foods, but also in other things as well, e.g. some paper. Starch is a white powder. Starch reacts with iodine to produce a blue or blue-black colour. It can therefore be used as an ‘indicator’,i.e.to test if starch is present in something. 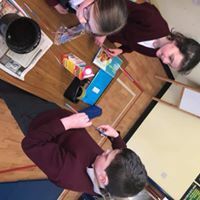 ​All classes from Junior Infants to 6th class worked like real scientists and tested a huge number of items with iodine to see where starch was present. We were amazed to find it in so many things!! Everybody’s fingerprints are different. This science fact greatly helps the police. Everyone has a dominant eye – it can be the right one or the left one. (The brain might get confused as to where an object actually is,or see on the double, if we did not) Every eye has a blind spot– the place where the optic nerve joins the retina. You are not normally aware of this with two eyes,as this phenomenon does not happen at the same time with the two eyes. ​One team was in charge of carrying out these investigations on every child in the school. We really enjoyed examining just how different everyone's fingerprints are - even twins prints are different! Electricity will only flow when there is a complete circuit. We love working with our electricity science kit! We worked in teams including infants to 6th class to create an electric quiz! We have included the team who's quiz was based on capital cities! The correct answer is connected, behind the cardboard, to the question; so if the correct answer is touched on the front of the cardboard the bulb will light up. If the wrong answer is touched the bulb will not light up, as there will not be a complete circuit. Plants need light, warm temperatures, air, water, and nutrients to survive and grow; different plants have different requirements for each of these necessities. A greenhouse works by providing light & heat for your plants, but the last three are up to you. 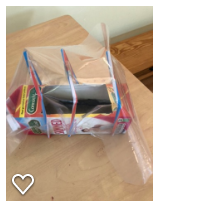 In teams children were given a milk carton, straws, a sandwich bag and some soil and asked to create their own mini greenhouse - the results were good and we will be planting seeds in them after the Easter holidays. ​We discussed rockets and travelling into space as a whole school. We watched some you tube clips of rockets launching and we found this very exciting. Then working in groups of mixed classes children used the resources given to build their own rockets. We had great fun testing out our rockets to see whose would travel the furthest. 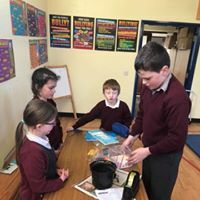 ​Working in teams, children from 1st to 6th class were set a challenge - to build a raft using 40 craft sticks and 20 rubber bands. Whose raft would hold the most marbles. Children spent a week planning and designing their rafts, as well as testing out different ideas. It was such an enjoyable task - and every team's raft floated! Well done - we have some budding boat builders in Barnacogue! !